The issue of women in Islam has become for many observers the evidence of Islam's incompatibility with modernity and human rights, particularly in its manifestations of patriarchy, oppression, ugliness and inhumanity against Muslim women around the world. How does this square with the theology and moral message of Islam? What does God intend for half the population of the world given the imperatives of the faith for both men and women? How do politics, socio-economic and other factors play into the place and treatment of Muslim women? There is much to be said on this critical issue and few as willing as Dr. Abou El Fadl to take a controversial moral stand on how women are often on the wrong end of the receiving line when it comes to just treatment. Speaking in God's Name tackles Wahhabi rulings and fatwas on women and critically analyzes failures in methodology and reasonableness, while countering with Dr. Abou El Fadl's original methodology for analyzing and establishing authority based on five contingencies: 1) honesty, 2) diligence, 3) comprehensiveness, 4) reasonableness and 5) self-restraint. 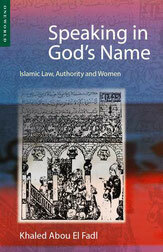 The book addresses head-on the unjust treatment of women in modern day Muslim contexts arising from Wahhabi interpretations of Islam and Islamic law. EXCERPT: "...Yet another woman attracted to the religion and repulsed by the followers—validated by the Qur’an and voided by Muslims. “When I first visited the mosque, believe me, I was dressed modestly. But a man ran yelling at me,” she insists. My first lesson in Islam was that men have bodies, women only have ‘awras (private parts). In fact, I am nothing but an ‘awra..."
EXCERPT: "...At times, legal technicalities are nothing more than a technocratic immorality. If people are objectified and consumed, no law or legal deduction could make the immoral beautiful or the ugly acceptable. I think of these jurists and reflect on their endless rhetoric about the rights of women in Islam—on the honorable role of women and on the covering-up of women. But I fear that the seclusion of women has taught them that what is secluded is to be possessed and owned. And, all possessions are to be used. Yet, some possessions are forgotten until thrown away, some are recycled or replaced. The fact is that those who ache to regulate women are those who invariably violate them, and those who are obsessed with defining the limits for women are those who observe no limits with women. Colonizers always set borders that affirm their power, and you, my technocrats, are colonizers of women..."
A full discussion of the covering of women, and more specifically, how God's Book has been corrupted in the modern day to become a message of misogyny and injustice against women. EXCERPT: "...It is clear that the authors of the translation and their supporters do not like women, and that they projected their inadequacies and deformities upon God’s text and the whole Islamic intellectual tradition. Truly, the agony of the Muslim plight in the modern world cannot be expressed either in words or tears. What can one say about those people who seem to have declared an unmitigated war against women and who brandish the weapons of grotesque misogyny? What can one say about those people who, in their utter ignorance and maniacal arrogance, subjugate even the word of God to their ugliness and deformities? “Who is more unjust than those who suppress the testimony they received from God, and God is not oblivious as to what they do” (2:140). Truly, “These folks, the cult they are in, is destined to ruin, and false is what they practice” (7:139)." Dr. Abou El Fadl delves into the controversy of the "beating verse," analyzing the verses, interpretations and understandings that illuminate its meaning, context and purpose. EXCERPT: "...She placed her forehead in her palms, squinted her eyes and then exclaimed, 'So, what you are saying is that 4:34 is not talking about disobedience, it is talking about lewd acts. In the case of a lewd act, known and proven in court, a court may order a separation or corporal punishment for a wife. In the case of a husband, corporal punishment may be ordered but we are not sure about an order of separation. But, on a separate matter, 4:35 is talking about normal but serious marital disputes. In the case of a rift between husband and wife—a rift unrelated to allegations of lewdness or the like—a court may order an arbitration?' I found myself suddenly pensive and subdued in thought. 'My sister,' I said, 'this seems to me a better and more beautiful interpretation.' (4:59) Yet, I promised no conclusions, for the flow of thought can only know tentative resolutions. But if I managed to create a shadow of doubt about the permissibility of wife beatings then the pious will stay away from situations of doubt. Only the most arrogant will dare assume the right to inflict a beating, and I hope that no woman will accept a husband who arrogantly takes liberties with her beauty and pride. To beat your family is an ill-manner and a foul and revolting action, and the Prophet said that he was sent to perfect our character. "I am repelled by ugliness, and I take refuge in the gift of the mind capable of interpretation. If I find in my heart revulsion and consternation, I take it to my Lord, and in the bounty of the Conference I extract the beauty of my Lord's creation. For God does not wish an injustice upon people (40:31). It is not God who commits injustice, but it is human beings who transgress against themselves (3:117). It is my Lord who said: "This is the [most] beautiful way (religion), so do not abuse it so as to wrong yourselves." (9:36) May God forbid that I be among the unjust and ignorant (33:72) who ascribes to God anything but the pure and beautiful. Surely, my sister, if we fail to interpret, we only transgress against ourselves." A weighty, thought-provoking and thorough discussion on the moral approach to the "beating verse" and other versus, which call for a deeper understanding of what the Qur'an and Shari'ah demand to achieve a superior moral existence. “'Sister, what if it is unprecedented? We do not serve God through a blind obedience to what we think is the law. We serve God through a perceptive examination of our understanding of the presumptions of the law. A precedent is there to guide, not to blind. A precedent points us towards the right direction, but it cannot become an obstruction to God’s way. “'There are precedents that confirm an absolute moral value. For instance, there are precedents that confirm the value of life or protect people’s honor. Life and honor are moral values. When we find a precedent that portends to promote a certain moral value, the only question is whether the precedent, in fact, furthers or promotes such a value. We examine the precedent in such a light. This can be termed a maqasid inquiry. The maqasid are the moral values of the Shari‘a. The ahkam (positive laws) of Shari‘a promote moral values, and it is our duty to ensure that the laws are, in fact, in the service of moral values and not that the moral values are in the service of the law. “'Keep in mind, my sister, that there are absolute moral values. These values are not factually contingent, and they are not historically or contextually dependent either. They do not depend on circumstance or on the level of human understanding or appreciation. For example, the preservation of life or the protection of the mind, which is protected by the prohibition against intoxicants that compromise the mind, or modesty, which is a part of humility and a part of the preservation of dignity, or honor, which is compromised by slander—all of these are absolute moral values. Absolute moral values are established by the divine command through cumulative ways; they are repeatedly affirmed by God and so there can be little doubt that they are in fact necessary and absolute, and that human beings must understand and promote them. "Taken somewhat off guard, I responded, 'I would not state it that way. I would say preservation of life, honor, and mind are absolute imperatives. Dignity is necessary for the preservation of honor and mind. I then ascend to the understanding that a resort to violence, in this stage of human development, tends to undermine a person’s dignity, and this undermines a person’s integrity of honor and mind. 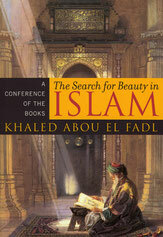 The fact that beating one’s wife was perceived by earlier authorities to be consistent with the absolute moral values of honor and mind does not bind me or you in any way...'"
Dr. Abou El Fadl presents the lives of Muslim women jurists in Islamic history, as documented from biographical dictionaries in classic Arabic texts, and analyzes what the objective facts of their lives reveal about their position, capabilities and accomplishments as women, jurists and learned teachers in Islamic history. He reflects on what the implications are for women in our contemporary times. In Recognition of Women, Minaret Magazine, Islamic Center of Southern California, Los Angeles, CA 1989. EXCERPT: "WHEN Imam Zuhri, a famous scholar of Sunna (Prophet Muhammad's traditions), indicated to Qasim ibn Muhammd (a scholar of the Qur'an), a desire to seek knowledge, Qasim advised him to join the assembly of a well-known woman jurist of the day, Amara bin Al-Rahman. 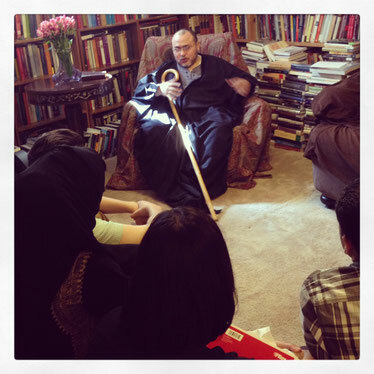 Imam Zuhri attended her assembly and later described her as "a boundless ocean of knowledge." In fact, Amra instructed a number of famed scholars, such as Abu Bakr Muhammad ibn Hazama, and Yahya ibn Said. 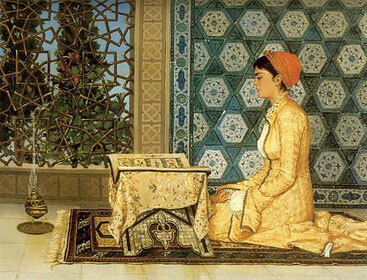 "Amra was not an anomaly in Islamic history, for it abounds with famous women narrators of jurisprudence, starting with Aisha, the Prophet's wife. A conservative count would reveal at least 2,500 extraordinary women jurists, narrators of Hadith, and poets throughout history. "That was then, but now we encounter hardly a single Islamic woman jurist. Women are all but absent from Islamic public and intellectual life. There are remarkable women activists in many Mosques and there are a few impressive writers, such as Zaynab al-Ghazali. But these are exceptions. One will rarely find a woman lecturing to a mixed audience about a gender-neutral topic such as "riba" (usury), for example. And while it is common to encounter professional Muslim women in every walk of life, it is very rare to find them on the boards of Islamic centers, or holding leadership positions. "There are several reasons for this alarming phenomenon. A particularly disturbing one is the derogatory attitude that seems to have infected many Muslim men. Very few are willing to be instructed or taught by women. Muslim men, in North America and elsewhere, seem to have developed a woman-phobia that consistently aspires to exclude women from conferences, meetings, gatherings, and even the Mosques..."